Food for thought: rummaging through backlogged papers, I cam across 3 notes from our heroic stockbrokers' bonds desks singing songs about the right timings for investment in bonds. These trace back to June and October 2009. So I asked myself the following question: should I have listened to your brokers' advice to buy Irish or US bonds in 2009? Well, here are two tables giving a breakdown on bond price sensitivities to changes in interest rates. The US table: And the Irish table is here: Now, in darker blue I marked the cells corresponding to the reasonably plausible scenario for yields for 2010. In lighter blue - the next best predictions. So go figures - should you have listened to anyone pushing Irish or US bonds onto you? Think of the following numbers - I don't have the same for the Irish markets - in the US, cash inflows into bond funds markets amounted to some USD313 billion in 2009, as yields kept on dropping to artificially low levels on the back of the US Fed buying up Federal paper. At the same time, as stock markets rallied, just USD2 billion net was added to stocks funds. 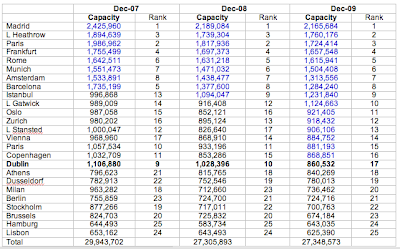 (Numbers are to November 1, 2009). Some has been fooled. So a Happy New Year for all and best wishes for the new decade! 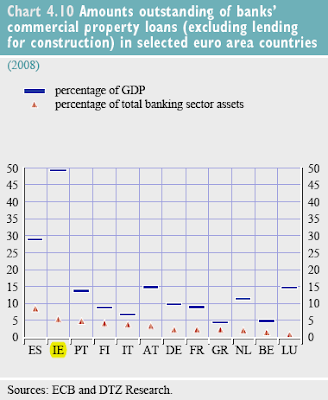 My next post will be already in 2010 and will show comparative performance for Irish banking sector relative to other EU states - the latest data - for 2008. We hear often about the loss of competitiveness in Ireland over time. Can we illustrate it? And if so, what can we learn from it? Here are the charts. Do keep in mind - higher values reflect lower competitiveness. In terms of unit labour costs, Ireland has not been competitive relative to its peers within the EU15 since Q2 2004 when we crossed over the Netherlands. I ignore Luxembourg here as it is a statistical aberration. 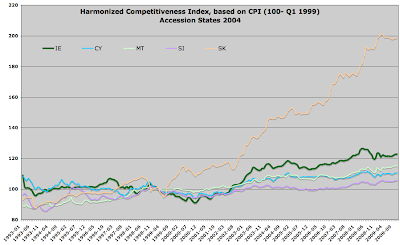 We've managed to lose all competitiveness gains incurred since Q1 1999 by Q1 2003. Majority of our peers have done so only 5 years later. while our competitiveness has deteriorated by a massive 22% since 1999 (and this is reflective of the significant gains in competitiveness over the course of 2008-2009), the average for peer countries was 6.2% and absent Ireland and Lux from the sample the rise was just 3%. 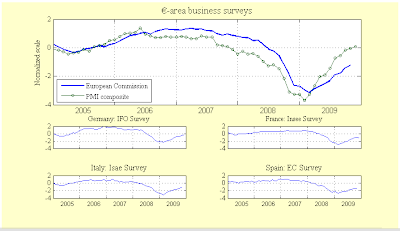 Chart above also shows that we have not posted a stellar performance against the latest additions to the Euro area. 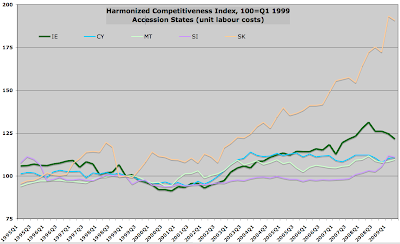 While Slovakia beats us hands down in terms of decline in competitiveness, remember - these are normalised series, so having started from a much lower cost basis than Ireland in 1999, they have been gaining significantly faster in terms of unit labour costs. 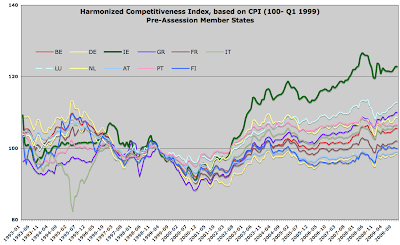 Of course, notice that before 1999, Ireland was starting from a higher cost point in 1995 than Slovakia. Is the cost of labour all there is to competitiveness? Well, no. Consumer prices draw another comparative. But strangely enough, the picture is virtually identical. Except, here pre-1999, more specifically in 1993-1995 - we were performing really pretty well. Having gone off the rails slightly during the mad days of the IT bubble - end of 1996- end of 1998, we then again performed rather well in terms of CPI until things gone out of control for us in the end of 2002. So what can we really learn from these four charts? 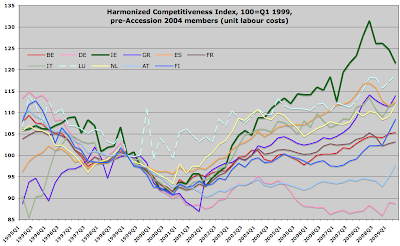 Ireland's loss of competitiveness is a long-term problem and requires long-term solutions - not a one-off cut in wages. On a different train of thought: an interesting idea that can be explored in 2010. Can we use the proceeds from our carbon tax to supply a long-term economic stimulus to the private sector economy? Here is a thought going in the right direction. Carbon tax in theory should be behavior-altering, so as consumers and producers reduce their emissions, the tax revenue should decline. To incentivise such behavior, carbon tax induces higher costs on energy use from non-renewable resources. But the revenue raised from the tax can be used to further enhance the incentives - if it is rebated back on the basis of lower emissions. This can also be done within a Cap-and-Trade system. Using revenue from carbon tax to provide direct income tax credits to households proportional to their annual per-capita heating, electricity and gas bills shortfall on the average. Having put into place a system for capturing data on such transactions, a rebate allowance can be estimated for each household at the end the year and this can be credited against the annual income tax. The system will provide net subsidy to those who use less CO2 emitting resources. Businesses will also be allowed to obtain a rebate, implying lower cost for doing business and investing in new technologies precisely for companies in the more productive services exports and modern manufacturing sectors. Best of all - the Exchequer will not get to treat carbon tax as just another regressive tax revenue raising measures that will simply increase the cost of living and working in Ireland. Of course, those not in the tax net should also receive the deductions, implying that some of them will become net earners from the tax system. As long as they are not enjoying lower cost of overall energy-related expenditure courtesy of state subsidies. For those of you who missed my article in the Sunday Times last weekend (December 27, 2009) here is, per usual, an unedited version of the text. By all possible measures 2009 will go down as yet another annus horribilis in the history of Ireland. Some 29 months since the inception of the crisis there is hardly any sight of the end of our depression – the worst on the record that any Euro area state has endured in modern history. 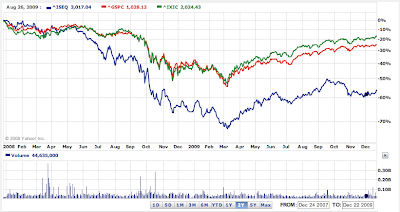 In 2008-2009 Irish economy has lost a compound 9.6% of GDP and a whooping 13.2% of our GNP. 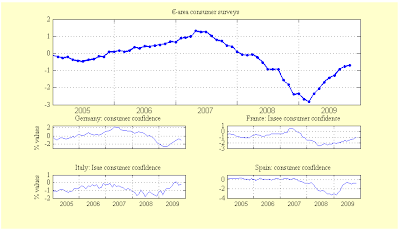 Over the same period of time, Eurozone economy has contracted by the total of 3.3%. Based on Department of Finance latest projections, by the end of 2010, our gross domestic output will fall 10.8% and GNP will have declined by 14.7%, against the European Commission forecast for the Euro area income contracting by 2.65% on 2007 levels. Put into perspective, assuming the current crisis runs its course as projected by analysts, the US will regain the 2007 levels of real annual income in late 2010. 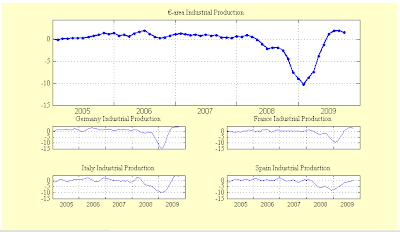 For Euro area, this moment will arrive in 2012-2013. Ireland is going to return to the 2007 level of prosperity in 2015 in terms of GDP and 2016-2017 in terms of GNP. And this is under optimistic assumptions of relatively robust growth post-2011. These figures only begin to describe the extent of our economy’s collapse in 2009. It is now a common realization amongst the economic forecasters that whatever growth we might achieve in the next few years, unemployment will remain at extremely elevated levels. In Q3 2009 official employment fell 40,200 on Q2 2009. This means that in 12 months to the end of September 2009, Irish economy shed some 183,400 jobs - the highest rate of jobs destruction on the record. In the course of this recession, we have now lost some 236,300 jobs. Back in December 2007, the live register stood at 173,200. A year later, it rose to 293,000, up 119,800 or 69.2% in 12 months period. This December, live register is lingering at 423,400 – an increase of 44.5% on 2008 levels. Sounds like an improvement? Not really. Such is the nature of statistical optics that an 8.8% rise in the number of people on unemployment benefits looks like an improvement in the rate of unemployment growth. If in the mid 2008 Irish economy had 17th highest unemployment rate in the EU27, by the middle of this year it was the 5th highest. Do the math: the above jobs losses imply that in 2009 some €13.5 billion was lost in employment-related economic activity in Ireland. This translates into an additional €4-5 billion in lost private consumption while our welfare bill rose by some €3.5 billion. All of these jobs losses (save for ca 5,900 jobs eliminated through natural attrition in the public sector excluding health services between the end of 2007 and the end of 2009) came out of the private sector. In terms of the drain on Exchequer revenue these losses simply cannot be offset through wage bill cuts imposed by Budget 2010 onto public sector. Even more problematic is the trend of falling labour force participation rate which has contracted from 64.2% to 62.5% in a year to Q3 2009. This change is extremely hard to reverse within a given generation. Much of the fall in 2009 has been driven by rising long-term unemployment, pushing people into permanent welfare traps, and net emigration. In 2009, some 45,000 non-Irish nationals left the country. I would estimate that at least 20,000 Irish natives did the same. On the net, CSO data shows that while unemployment climbed by roughly 120,000 over the last 12 months, the actual fall in employment was 185,000. These people have left their productive employment in this state and moved on to work elsewhere. Many worked in the construction and domestic services sector and had skills beyond their jobs. Many worked in industry – where their skills and future productivity were being enhanced by on-the-job training and through experience. In Q3 2009, industry displaced construction as the leasing source of new unemployment. 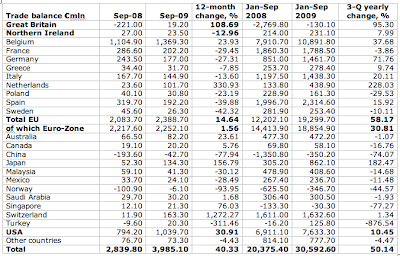 Quarter on quarter, industry lost 12,200 jobs in Q3 2009 relative to Q2 2009, while construction sector lost 8,700. But scores of those who are now emigrating out of Ireland worked in traded services and here the losses to our productive potential are even greater. 2,300 jobs were lost in professional, scientific and technical activities in Q3 alone. The future of Irish economy is in traded services – the elusive 'knowledge' economy we've been pursuing. This economy requires more people with cultural, linguistic and skills sets that are distinct from our 'national' averages. Given that we cannot hope to retrain lower skilled workers to take up jobs in professional services exports, the loss of junior non-national staff in finance, professional services and ICT is doing irreparable damage to our international competitiveness. The good news, of course, is that we are now starting to see some re-hiring in financial services (600 net jobs created in Q3 2009 relative to Q2 2009) and MNCs-supported employment remains strong. The bad news is that serious layoffs are yet to materialize in the state-supported banking. 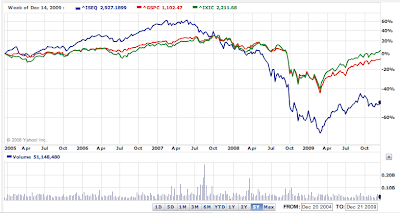 Lastly, 2009 was another year of banking sector disasters. Irish banks began 2009 teetering on the verge of full blow bankruptcy – with our third largest bank falling into the hands of the state and two largest banks seeing their shareholders’ capital virtually wiped out. 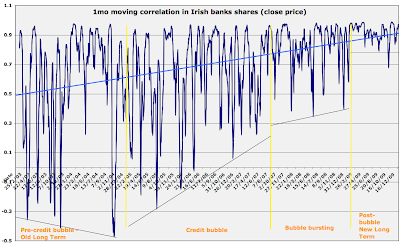 The crisis of the early months of 2009 was temporarily resolved by the introduction of Nama, leading to a robust, but short-lived rally in banks shares. The real problems – weak balance sheets, pressured deposits, precipitously collapsing asset valuations, rapidly deteriorating loans performance and dwindling capital reserves – remain unaddressed. Thus, as was predicted by this column in May 2009, the Nama solution turned out to be nothing more than an expensive means for delaying the inevitable. It is by now an accepted consensus that nationalization of the main Irish banks is an inevitable denouement to the saga of misguided banks rescue measures that began with the regulatory Green-Jerseying of the banking sector against the short-sellers in the late 2007, progressing to the wholesale banks guarantee scheme in September 2008, and via nationalization of the Anglo Irish Bank, on to Nama passage in 2009. All along, Irish Government and banking sector have made all efforts to evade and silence critical independent analysis of the causes of the current crisis: inept regulation and enforcement, reckless risk-taking in lending and funding, and wrong-footed solutions advanced by the State. The Irish taxpayers are now facing a bill of tens of billions of Euros, as well as the decade-long prospect of zombie banking, development and property markets and construction sectors – courtesy of Nama. Just as in the end of 2008, only the stock markets are now capable of reflecting the extent of the expected Nama damages back to the economy. 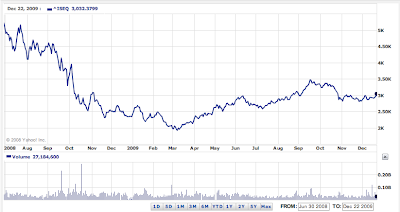 AIB shares are now trading some 36% down on their January 2, 2009 levels and 67% down from their 12-months peak. Bank of Ireland shares, having gained 32% on January prices are still down 66% on the 12-months peak. As Winston Churchill said once: “Courage is what it takes to stand up and speak; courage is also what it takes to sit down and listen.” One can only wish our policymakers discover the second half of this dictum in the New Year. Per latest CSO data, average weekly earnings in the Public Sector (ex Health) rose by 2.5% in 12 months to September 2009, reaching €969.11 per week. While the lower rate of increase is a welcome sign of some moderation in public sector pay, the numbers reveal a farcical nature of the Government’s efforts to date to control its own expenditure. Weekly earnings for the Regional Bodies rose by 4.6% (from €815.58 to €852.71), the Education Sector by 3.0%, from €944.49 to €973.10. An Garda Síochána weekly earnings excluding overtime decreased slightly by 0.1% from €1,077.55 to €1,076.22 for the same period. Now, compare this record with the rates of increases between September 2005 and September 2009 when average weekly earnings in the Public Sector (excluding Health) rose by 14.2% from €848.94 to €969.11 per week. The same lack of progress on reducing public expenditure is manifested in the numbers employed in the sector. Natural attrition with recruitment bans has produced a decline in Public Sector employment from 369,100 in September 2008 to 360,900 in September 2009. Just 8,200 or 2.22% fewer people worked in the Public Sector in this country despite the nearly total collapse in the Exchequer revenue. In the four years to September 2009, employment in the Public Sector rose by 17,300 to 360,900. If Ireland’s public sector employment pay and numbers were to be benchmarked against the UK levels, it would take some 15-20 years before these rates of ‘moderation’ bear the fruit of reaching parity with our next door neighbors. Casey Mulligan's excellent defense of Chicago School is now in print in Berkeley's Economic Press (here) - a must read. The Federales are yet to inject some 50% of the allocated economic stimulus. So the charts above show US middle class freeing itself from the shackles of negative equity via foreclosures - and in the process regaining back financial safety and confidence. This is exactly what is missing in Ireland, where a debt jail awaits anyone who dares to default on negative equity home mortgage. While this approach reduces moral hazard, it destroys any chance for a households-led recovery in Ireland. My favorite topic is back... travel figures. RTE reports on industry estimates of 12% fall off in the number of foreign tourists (not visitors) to Ireland (here). More interesting data is courtesy of Ryanair release (these guys really should win a transparency award for publishing the data that some parts of the public sector do not want us - the public - to know). 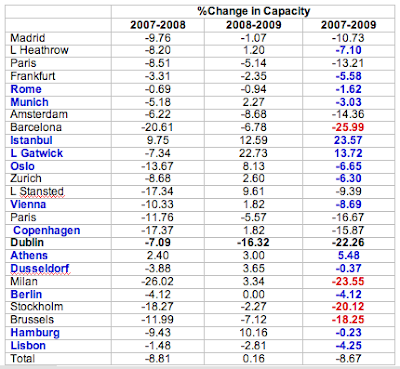 Dublin Airport’s seat capacity has slumped from 10 to 17 ranked in a league of EU airports this winter. The report, by RDC Aviation, also shows that Dublin Airport has suffered the largest capacity cuts of any of Europe’s 25 largest airports. This slump proves that the Govt’s €10 tourist tax has devastated Irish traffic and tourism in 2009 and disproves the Dept of Transport’s false claims that Dublin Airport’s traffic collapse is “an international phenomenon” (per Ryanair statement). Notice airports that outperformed Dublin (in blue above) - all selected on the basis of their traffic similarity with Dublin - localized, regional traffic with smaller share of transit passengers for international connections. Now, ANOVA for the above: while Dublin numbers changes do belong in the sample for 2008, the same is not true for 2009. This tends to support the argument that changes in Dublin capacity are not consistent with overall deterioration in economic conditions internationally. So here we have it - another source of evidence to support 'Gurdgiev-Ryanair' conjecture that airport taxes and charges are undermining Irish airlines and travel sectors. Note - the fact that airlines are being hurt is evidenced by the fact that all major airlines present at the Dublin Airport - not only Ryanair, but also Aer Lingus, EasyJet and BMI - have made such a claim to the Government. "First of all you have to consider the timing of the tax, to what extent does it coincide with the fall in numbers." This is precisely what is addressed in 2007-2008 and 2008-2009 growth rates that I added to the data. Full impact of travel tax took place in 2009. Notice the discrepancy in the rates of decline at Dublin and the differences in the Anova table - they show that 2009 regime was completely different from the 2007 and 2008 regimes. "Then you need to allow for any other taxes/charges in these other places and their change." Actually, no - I do not need to do so. If other places had any change in their travel tax rates, there will be an effect on these airports in the first order, and on Dublin airport at the very best in the second order. The first order effect, I would assume, will be simply much larger. Furthermore, several airports on the list have lowered their charges and several governments have repealed their travel tax. I do not control for this precisely to err on the skeptics side. Re-weighting figures by removing from the sample those airports where charges and taxes were reduced in 2009 actually changes the Anova bands by less than 0.2 points, without altering the conclusions. "And of course you need to control for any other factors that differentially impact on capacity which may or may not be correlated with the variable you are interested in." True. But what these might be? Macro shocks are suggested. Ok, take the logic here - the figures are bi-lateral capacity. So, if, say, potential Italian tourists to Ireland were less adversely impacted by macro shocks, their propensity to travel to Ireland would be less adversely effected by income shocks. Since Ireland experienced the worst 'macro shocks' of the entire Eurozone, then the differences in macro shocks will act to improve traffic through Dublin Airport. What other forces can be acting here? Higher airfares? Not really - Dublin offers some of the lowest airfares, net of taxes and charges in the EU15. And it is being compared against other full cost (not low cost) airports. So price effects, again, are acting to strengthen my argument, not to weaken it. lack of time dimension post-tax introduction. So we can wait for another 10 years to get the data sufficient to test causality (if we do get it - remember - Dublin Airport alongside Tourism Ireland and DofT are actively attempting to suppress public releases of data on tourism flows through Dublin). Or we can just settle for the second best - an Anova. Finally, as in medicine, economic policy should always err on the side of upholding the principle of inflicting no harm. this means, that absent full analysis of economic feasibility, no tax policy change should take place. Can anyone point me to such analysis in the case of our travel tax? 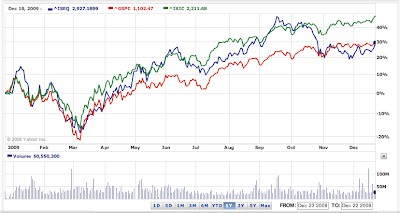 Two recent datasets: CB's Investment Funds in Ireland and ECB's Financial Stability Review for December 2009. 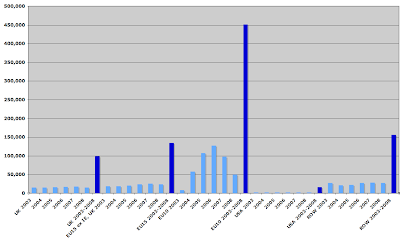 This data, of course, covers IFSC-based funds which dominate (vastly) the entire sample. Overall funds issuance is up robust 16.6% (although activity on transactions side is falling - we cannot tell anything about seasonality here, as the CB just started collecting data). Real estate funds are out of fashion. Clearly so. Mixed funds and hedge funds are relatively flat and judging by the collapse in transactions are still in batten-the-hatches mode. Equity funds are in long-only mode, on a buying spree. Nice sign of renewed confidence in the global markets. Bonds funds are steady rising, albeit not at spectacular rates, which, of course, is a sign on IFSC missing on bonds over-buying activity going on worldwide. Chart below shows how the market shares evolved over time. So the US leads, as per IMF GFSR, with most writedowns in quantity and relative to the system. The UK comes second. Emergent markets are catching up. Japan has much smaller problem, unless yen carry trades unwind dramatically. These are on track to complete writedowns in 2010. But EU states are lagging. 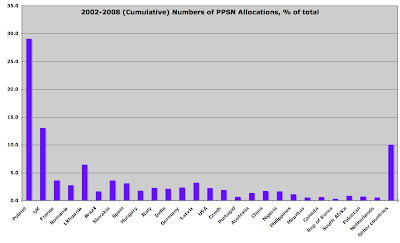 Ireland's figures are skewed by IFSC institutions taking serious writedowns. But overall, we still have some distance to travel on domestic banks front. Next chart shows just how advantageous our low profit margins on the lending side have been in terms of yielding lower burden of debt servicing. This can change very fast in the New Year as retail interest rates are bound to rise. No top-up mortgages here or car loans and personal loans secured against house assets, etc. And also note that these refer to the 2005 benchmark, plus, of course, these are percentages of gross income. Given our households are now faced with some of the highest income taxes in the Euro area, good luck sustaining this low burden into 2010. And another issue - notice how significant is the rise in burden for lower income households. Guess which households are also facing higher rates of unemployment? 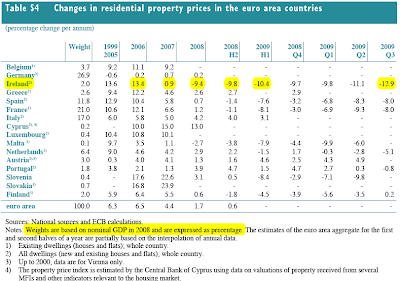 Table above shows the deterioration in house prices in Ireland relative to other countries. 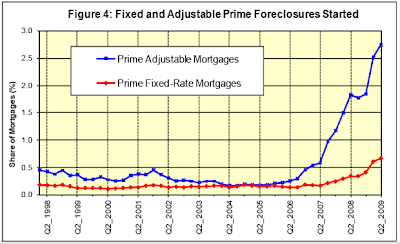 We are now 21.1% down on 2007 figures, or at 90.9% of 2005 level of nominal prices. The worst performance of all countries, including such bubble-lovelies as Spain. And on the commercial real estate side, we are an outlier by all measures (remember, unlike Spain, our total banking sector includes non-domestic banks as well). That is another mountain yet to be scaled in this crisis. 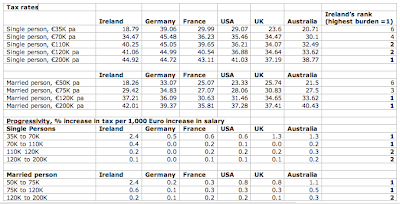 Note how dramatic is the tax burden for higher earners in Ireland. Now, give it a thought. We want to build a 'knowledge' economy. The main input into such an economy is individual skills of the employees. This high skills-intensity of production in the 'knowledge' economy means paying key employees more than in the 'dumb' traditional economy, where physical capital takes up much larger share of total value added. In other words, 'knowledge' economy must compete globally for human capital. The higher the quality of the talent, the greater is the intensity of competition and thus, the more important are the tax rates charged on such labour. Our tax rates simply are inconsistent with such competitiveness. Funny thing is that most of our media - especially the Irish Times and RTE - keep on banging about the need for creating a vibrant 'knowledge' economy, while at the same time calling for higher taxes on top earners in the private sector. Given that both papers have absolutely no real economics analysts on board, this contradiction is not surprising - it takes a real economist, with a wide knowledge of economic theory and empirical analysis, to understand the complex nature of productivity and returns to various forms of capital. Ex-banks folks and ex-political correspondents simply won't do here. France and Spain continue to worry in the above due to clearly weakening domestic demand, while Italy and Germany are showing signs of advanced orders falling slightly off - future exports might be challenged. 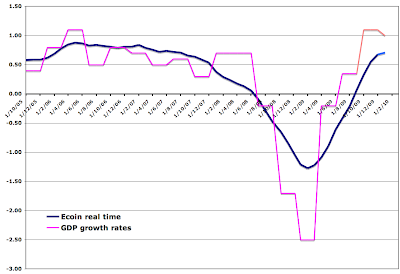 So forecast is for moderation in Eurocoin rise and thus a slowdown in the increase in growth into Q2 2010. 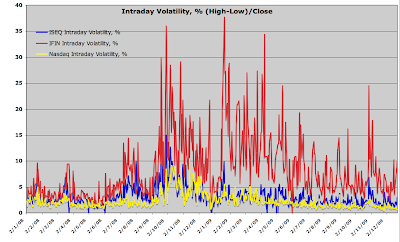 Will Q1 2010 be the strongest bounce of 2010? Chart above is claimed to represent just how far behind American consumers are from their more environmentally conscious European counterparts. But here is an interesting thingy - do these answers actually support such a conclusion? Take question 1: Companies should be penalized for failing to care for the environment. Since no conditioning references are given to the legal nature of such a failure, one can assume two possible meanings - (A) "Companies should be penalized for failing to care for the environment over and above the confines of the law" and (B) "Companies should be penalized for failing to care for the environment within confines of what is allowed by law". In case (A), the question asks whether companies should be penalized for carrying out legally permissible actions, in case (B) for carrying out legally prohibited actions. If you live in a society with well-protected legal rights and directly accountable judiciary, you would be more likely to lend no support to case (A) while case (B) will be trivially true. If you live in a society where that which is not prohibited explicitly is permissible, as the US, you would say No. In EU, where judiciary is far less directly accountable and laws are often more arbitrarily and less transparently imposed and politically intertwined with ethics and even aesthetics, a person would more likely to assume that the question refers to case (B), which supports an answer 'Yes'. How great is the margin of difference between two? Is it enough to erase most of the difference shown so 'conclusively' in the graph? I don't know. both questions will warrant fewer 'Yes' votes. Has this anything to do with environmental attitudes? Or has it more to do with balancing out the cost to the environment with the cost to quality of life? Is it a decision on the margin or a decision on the absolute? Why does air travel warranted two out of six questions in the entire set? Because it contributes more CO2s than other? No, airlines account for roughly 2-3% of the total global CO2 emissions. And this combines domestic air travel and international air travel. And yet they managed to get 33% of the entire questionnaire. The key here is the idea of the airlines as being a perfect target for a tax. The logic here is to charge passengers to change their behaviour. There is problem however, with the question as it assumes that higher taxes mean lower emissions. This might be what passes for prohibitions-based economics in Europe and the UK, but it might not be consistent with what Americans might think about positive and negative incentives. Americans generally think of going for the Big Return measures/investments first, and only later for the marginal measures. Hence, the lack of support for Kyoto in the US, given that it excludes some of the world's largest polluters - like China. Europeans always prefer going for the 'cute' policies - the Alessi Environmentalism of cute and loud NGO-supported and advanced-marketing measures. And Americans might be right in their approach. Switching, say, 20% of China's electricity production into nuclear might actually do more good to the environment than banning all air travel outright. Americans would know this. Europeans (save for the French) would not, as anti-nuclear hysteria of the 1980s has spelled taboo on public debates on nuclear energy in most of Europe throughout the previous two decades. Or switching world coal powered stations to clean coal. Or using advanced capture and sequestration technologies to remove CO2 emissions, or using smart approach to managing existent systems rather than blindly building windmills and setting excessively populist targets. All of these more efficient applications are spearheaded by the US. Not by Europe. There is another aspect to the questions - as a younger society, America is much more mobile than Europe. And it is the younger generations that hold power in determining mobility-focused legislative initiatives there. In Europe, older generations are immobile and they hold political power. So taxing younger Italians and Frenchmen and Spanish women moving between their jobs and home or to study abroad is kosher for European populace, because life in Europe is about preserving status quo of wealth distribution (old hold all, young hold none, when it comes to capital and income). So let me run through this quickly - charts above show Europeans to be about as 'green' as the UK, with Americans lagging far behind. The numbers above show this to be untrue. And despite the US consumers changing their behavior most dramatically during the downturn, their propensity to behave green has not diminished. there is most similar to that found in the Netherlands or France." Ahem, so environmentally lagging Americans are just as good/bad as environmentally sound Netherlands and France?.. And this is more than just words. 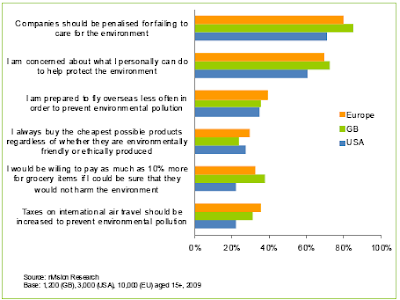 "If we examine whether or not consumers who say they are environmentally friendly do actually behave in a green way, we see some interesting transnational patterns. The map below shows the proportion of consumers who say they are concerned about what they personally can do to help the environment who also behave in a green way under our definition." So what's the EU average 'greeness', then? Above the US or below? Given the US is not far behind the leaders within the EU?.. 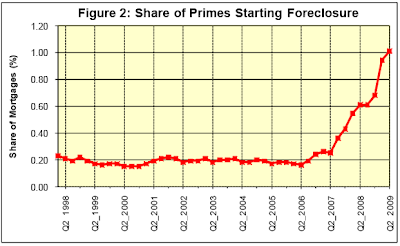 Zone 1: through December 2004 - the tail end of the pre-credit bubble conditions, when Irish economy still had some residual Celtic Tiger growth in it. And, aptly, the banks were still financing growth in real economic activities. Thus, we clearly have periods where correlations fall below 0.3 levels, signaling some differences between the two banks. And they occasionally were reaching below zero, signaling substantial differences between the banks. Zone 2: January 2005-July 2007 - the credit bubble. During this period, the two banks worked hard on erasing any significant differences. One went to the UK, another followed. One landed in 100% mortgages, another followed. One started to throw money after cowboy developers. The other followed. And so on. If in the previous period, min-min correlations envelope (the extent of diversification offered by the shares pair) ranged from -33% to -37% and to -47% (implying occasional flight to hedge opportunities of substantial degree and rising though out the period), in the Zone 2 period, min-min envelope ranged from -28% to -6.4%, shrinking the flight to hedge opportunities. In other words, the two shares were much poorer diversification instruments against each other. 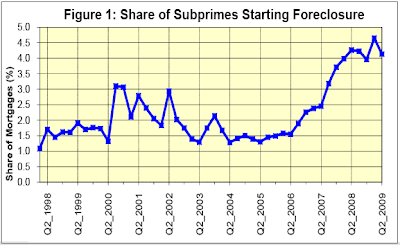 Zone 3: August 2007 - January 2009 - the credit bubble bursting period. Here, the two shares converged to telling virtually an identical story. It was, indeed, true that by the end of this period, BofI and AIB became virtually indistinguishable. One's own risk was matched by the other risk. And the min-min envelope shrunk from 37% to 41%, getting dangerously close to that 50% mark. Zone 4: Since February 2009, the min-min envelope has contracted to 79.3% signaling that in effect the two shares have no substantial differentiation between them. In other words, from the point of risk hedging or risk-return consideration (e.g. under mean-variance criterion-based models) there is no reason to hold both stocks in a diversified portfolio. 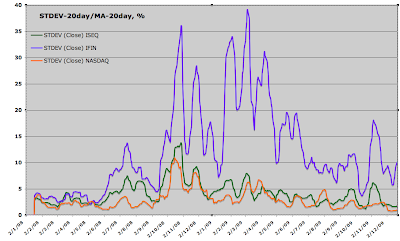 The surprising, indeed amazing, stability of these correlations since February 2009 suggests that the markets have reached the new equilibrium - or the New Long Term, where the markets no longer are caring for separating BofI from AIB. One more thing is worth adding. 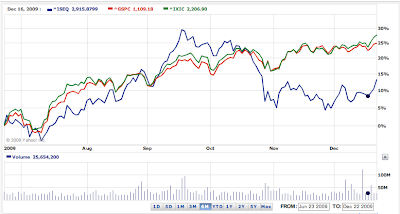 You'd think that a look at pairwise correlations between two largest banks in this country would be warranted for our technically apt and smart stockbrokers... You'd be wrong - as far as I know, none seemed to have been bothered to send their clients a simple chart on correlations between the two banks. 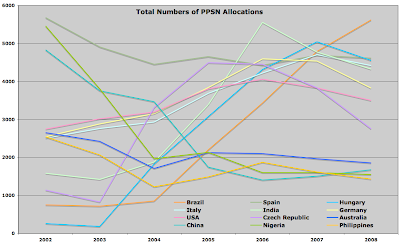 To start off the post-Christmas season on an interesting note, here is a different look at the CSO's data on PPS allocations. 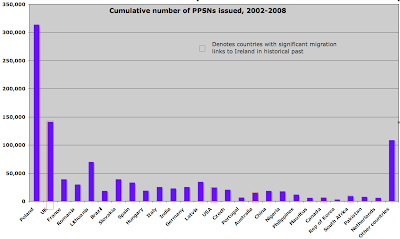 Cumulative PPS allocations over 2002-2008 show clearly the magnitude (absolute and relative) of migration from Poland to Ireland. It is worth highlighting the fact that the number of people moving to Ireland from the countries with strong historical links to this country is smaller than that from Poland, and close to that from the 3 Baltic States. Of course, the relative potential pool of migrants from the historically important destinations for Irish emigrants in the past is of magnitude of 100 times greater than that of the Baltic 3 entire populations. 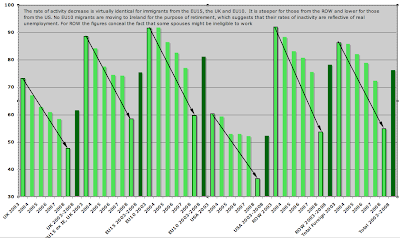 Total immigration figures are impressive, peaking in 2006 and falling in 2008 to the average of 2004-2005 levels. Looking at the same in terms of countries, the above graph shows again how dramatic was immigration from Poland relative to other countries. 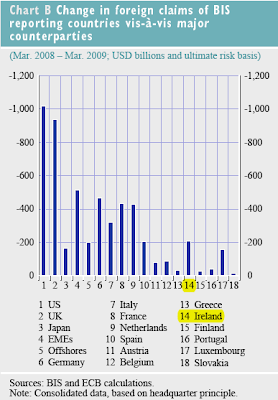 In 2005, tiny Lithuania sent more people into Ireland than any other country save for UK and Poland. 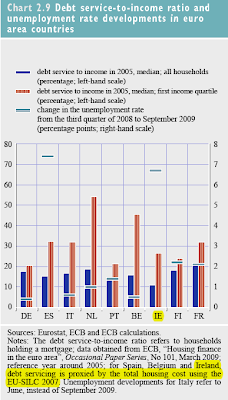 However, as credit bubble blossomed back in the Baltics, Lithuanian and Latvian migration started to decline after 2005, as was the case with Slovakia post 2006. A messy chart above shows several interesting trends in migration from other countries. Nigeria - a clear decline post Michael McDowell-led reforms of the free-for-all asylum processes. Brazil - massive increase between 2004 and 2008. Whatever the reasons might be? Philippines - no dramatic slowdown in inflows, save for 2002-2004 period. In other words, given that the Philippines is the leading country supplying nursing staff to HSE, there is really no evidence here that Filipino nurses stopped coming to Ireland (remember the claims made by the trade unions). There are many other interesting things going on in the chart, so feel free to interpret/speculate. 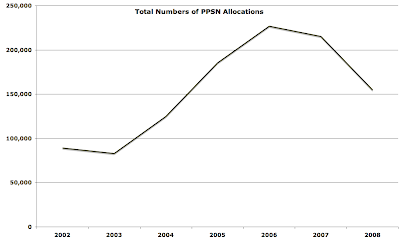 Some more trends in PPS allocations in 2002-2008 above. As percentage of the total, Poland's weight was still increasing in 2008, relative to all other major destinations sending immigrants to Ireland. 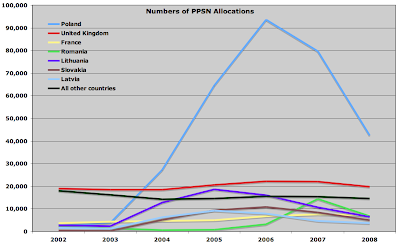 Here is a funny thing - 3 Baltic states accounted for more allocations in 2004-2006 than the UK, the rest of the EU15, the US and even the rest of the world. Amazing, given these three countries are about 1/100th of the EU27 population. And, given that incomes were raising in these countries at very high rates, why would these three countries attract such a massive migration to Ireland? Perhaps the reason is coincident with the anecdotal evidence that vast majority of migrants from these 3 states were Russian speaking. Of course, if this is true, it would represent a small embarrassment to these countries' leaderships, because it would illustrate dramatically how prosecution of Russian-speaking minorities in these countries was pushing people to emigrate. But, again, this is speculative at this point in time, as we never bothered to ask these people their ethnicity, as opposed to their citizenship. Note the dramatic dynamics for the EU10 - virtually none in 2003, jump in 2004 and on to peaking in 2006. what does it tell us about these workers? Prior to 2004, they had to compete with the rest of non-EU employees for jobs. And they were not very good at it, apparently. Post 2004, they no longer had to face real competition. And they became, overnight, very good at getting jobs. Suspicious? Me too. Just shows how arbitrary the world is out there - your skills, your aptitude, your knowledge - all these matter as a secondary differential at the very best. Your passport is what determines who you are, can be and will be to a greater extent. 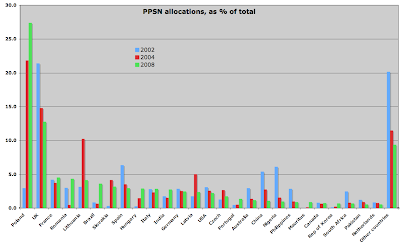 Total allocations to foreign nationals above. 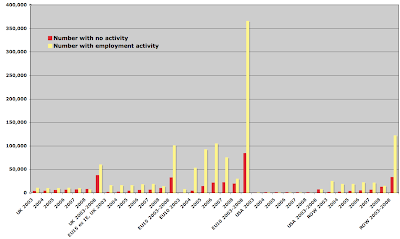 The above chart shows that overall, the groups with no employment activity were dominated not by the EU10 citizens, but by the UK, EU15, and US migrants. Why, you might ask? Well, citizens of these countries came to Ireland for many reasons, some of which were simply not available to those from EU10 - retirement would be one, second homes would be another one. In other words, it is not that the citizens of these countries had lower propensity to work in Ireland, they simply were more heterogeneous (age wise and occupation/income wise). EU10 numbers for 2008 also conceal the fact that many of those migrants probably moved into gray economy (cash payments) and into sub-contracting, both not recorded by PAYE system. This increases the rate of non-participation for these immigrants. Absent MNCs-led sectors in our economy, we would be running massive deficits even accounting for the wholesale collapse of consumer imports. And note that as our own economy is shrinking, net contribution of MNC's own trade balance to our GDP is rising in importance. 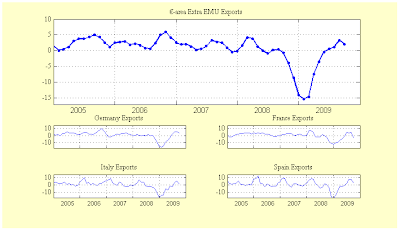 Exports to Australia, China, Japan, Switzerland, and the USA are significantly improving over September 2009 relative to the first 9 months of 2009 – a strange result, given these exports are subject to dollar – euro exchange rate fluctuations. And one caveat - the cases where dramatic improvements in trade balance do not match those in exports are, of course, reflective of the collapse in imports. 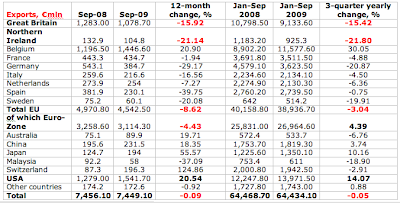 But it also shows that 2008 was much worse for Ireland Inc than it was for the benchmarks. And despite the deceptive nature of statistics (remember - we started 2009 at a much lower valuation than other indices, so we could have expected a much stronger bounce from the bottom over 2009 bear rally), we remain heavy underperformers over 5 year horizon. 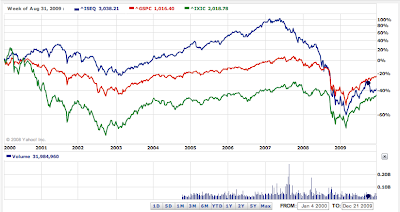 Yeeeks... At the beginning of the year, I predicted that the markets will continue discounting Ireland throughout 2009 on the back of the adverse news flow (deeper recession, failures in fiscal governance and collapse of banking) relative to the broader global indices. Clearly, they did. Oh and one more reminder - back in July-August 2008 an MD of our top-5 stockbrokerage firms issued a fanfare-sounding Green Jersey note telling his clients that 'markets come back'. 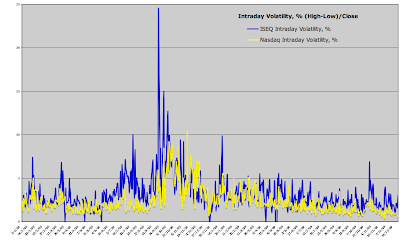 Were we to listen - we would be buying ISEQ at 5,070 and valuing it today at under 3,000 - a 40.8% drop. Some price for a Green Jersey. So markets do come back, don't take me wrong - except in their own time and at their own speed. Better luck in 2010, folks!